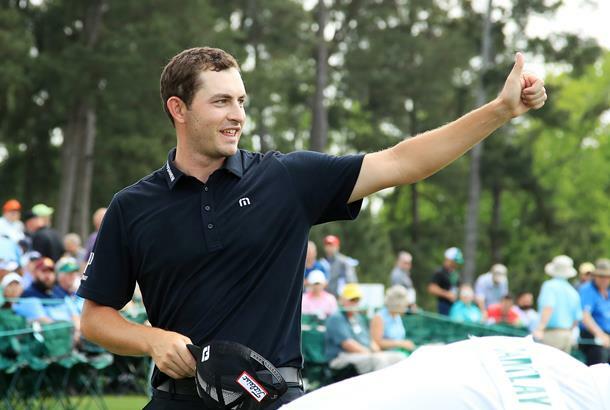 It may not have been a course record, but Patrick Cantlay, Webb Simpson and Tony Finau all ensured they would put their names in the history books: Until today, there had never been more than one round of 64 or better during the entire week at the Masters. Third round leader Francesco Molinari finished with a 66, and goes in to the final round of the Masters with a two shot lead. Patrick Cantlay was the first player to prove the course was gettable on moving day as he followed up consecutive rounds of 73 with a bogey-free 64 that moved him to six-under-par. In two starts here, it was the first time Cantlay has posted a round in the 60s, and he did it by carding four birdies on both the front and back nines on Saturday.The 27-year-old, who was the leading amateur here in 2012 and missed the cut last year, said conditions were the easiest he's ever faced at Augusta. "Out of all the rounds I played here this was the easiest scoring condition wise," Cantlay said afterwards. "I got out early and the ball was going the right distance, the wind wasn't blowing too much, greens were soft, and the hole locations were much easier than the last few days. "I thought the last few days the hole locations were really tough and I saw a few that I actually had never seen before. So it was kind of the perfect storm for a good round. "I controlled my distance into the greens a little better and I was coming in from the fairway more, I drove it really well today, and I made a few longer putts early in the round. I just hit it really solid, I hit a lot of really nice shots." Cantlay's birdies came on some of the hardest holes on the course as he picked up shots on the first and fourth holes to get back to level par for the tournament, and added two more on the sixth and ninth but failed to make the most of the par fives. In fact, the 15th was the only par-five of the day that Cantlay did make birdie (his seventh gain of the day), before adding a final birdie on 17. "I forgot to birdie the easy holes. I just felt like I hit a bad drive on 2 and didn't birdie 2. Made a nice par, actually. I should have birdied 3. I almost was able to drive it on the green, I was just short. Hit a bad chip. "I birdied a lot of the harder, hardest holes, I birdied 4, I birdied 9. I didn't birdie 5, that's too hard. I birdied 11, I hit two really, really nice shots on 11 and that kind of propelled me into the back nine. Birdieing 14, 14 always gives me trouble with that lie below my feet, but the hole location there is a little easier. And fortunately getting the ball up‑and‑down from the fairway after driving it in trouble on 18 is huge." Perhaps one of the most impressive moments from Cantlay's round though came on 18. He needed a birdie to match the course record but drove it in to the lip of the fairway bunker and had to pitch out. He then made a superb up and down to ensure a bogey free 64, which he called his most important moment of the day. "Getting up‑and‑down on 18, the lip shot. Just, just getting up‑and‑down after all that was big." 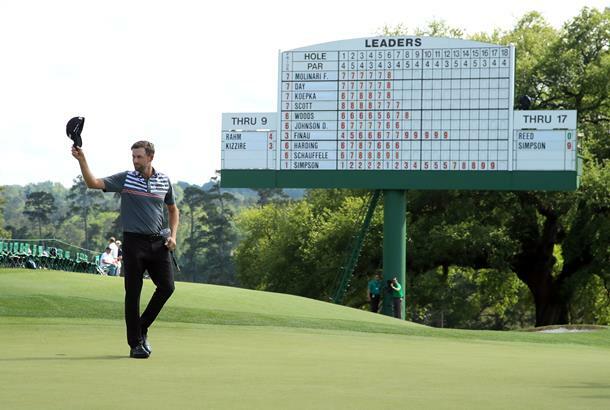 Webb Simpson hit all 14 fairways and 16 out of 18 greens on his way to getting the early clubhouse lead at 9-under with a 64 of his own, and currently sits four shots behind third round leader Francesco Molinari. Simpson began his round with a birdie on the par-five second but made a bogey on the sixth, which he decided to use as motivation. "I made a sloppy bogey on 6 and I just kind of had a talk with myself going back to 7 tee thinking about all my bad shots this week have been just some poor thinking and not being really committed to what I decided to do," Simpson said. "And I just said hey, if you stay fully committed the rest of the day, you're swinging great, you're putting well, you're going to make birdies and that's what I did. A change in mindset worked as he carded four birdies in a row from the seventh before he added an eagle on the 12th and two more birdies on 14 and 16 to reach the top of the leaderboard at nine-under-par. Simpson said he felt that he was able to take advantage of the soft greens as the conditions allowed the medium hitters in the field have a chance at making a move up the leaderboard. "I mean the fairway's certainly gotten wider and I'm hitting hybrids and 5‑irons into a lot of these greens, so it's a good thing for me, I'm one of the average at best hitters in length and I don't mind having hybrids in, as long as the greens are soft." 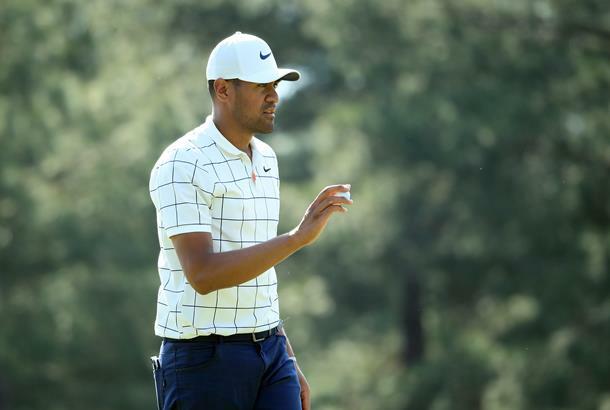 Tony Finau had a chance to beat an-all time record as he raced to six under par with three birdies in a row from the first, a birdie at six and eagle at nine. He ended up making par on the final hole of the front nine to tie the Masters record of 30, but it wouldn't be the end to his run. Finau added birdies on both the par-five 13th and 15th holes to get to 11-under-par and take the clubhouse lead for an extended period of time until Molinari went on a late birdie run of his own, but he still guaranteed a spot in the final group on Sunday. "I felt good," Finau said after his round. "I'm driving the ball nicely, and on this golf course, I can attack the golf course if I'm hitting my driver well, and I have been thus far. I felt good. Going into today, I felt calm and comfortable, and I think my score showed that. "But I got off to a nice start. I was happy to make birdie on 1. I hit two great shots and a putt that just barely lipped in on 1 and was kind of off to the races there. I drove it nicely and a couple tap‑ins on 2 and 3 and I was just kind of on my way, I kind of got in that zone. "And looked up at the leaderboard, and I knew I just needed to ‑‑ I was well in front of the leaders, I needed to keep making birdies, because I knew they were going to have a lot of opportunities, the guys that were playing well. "I was happy to post the number I did, but more than anything, just keep my foot on the gas pedal and not let off, because looking at the scores now, I may not even be leading after today, but I'm well in contention, and I'm happy about that. "I would say I was in the zone today, just staying in my lane, trying to do my thing and just trying to finish as high as I could possible; as low as I could, you know what I'm saying, on the leaderboard, as high as I could and the lowest number I could shoot."